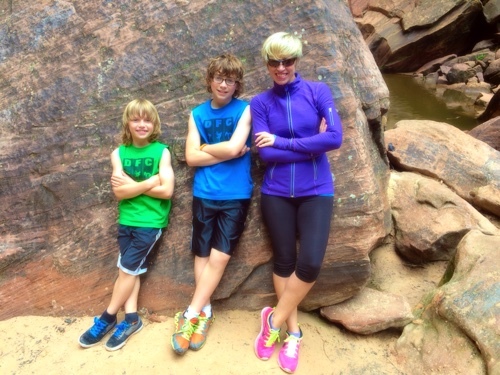 Bikes: The Best Way To See Zion National Park With Your Family | Fit Family Robinson | The world is your gym. 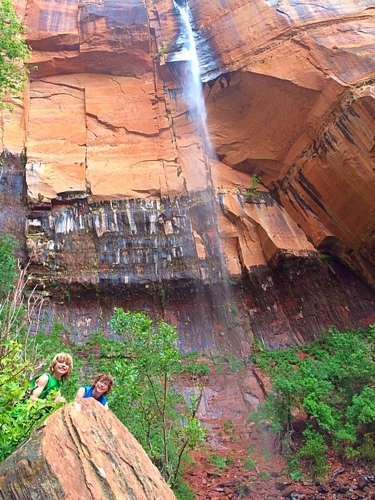 The Fit Family Robinson hit the road last weekend for a trip to Zion National Park. We’d been before, but this time we took our bikes, seriously amplifying the experience of this majestic place. 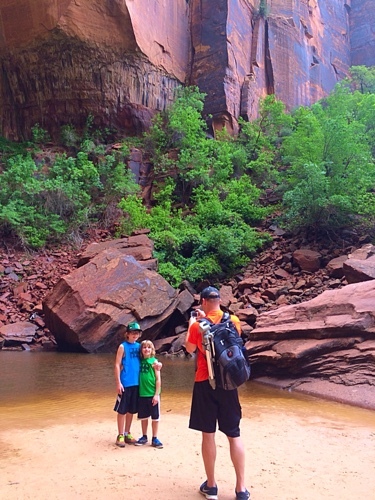 Below are some tips to help you plan the perfect family day of biking and hiking in Zion. No cars allowed. 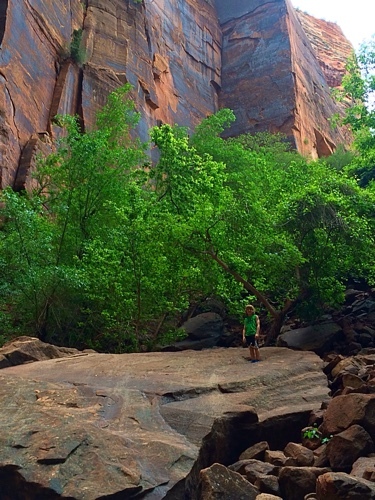 Most of Zion Canyon—including the trailheads for its most famous hikes—is closed to automobiles (with a few exceptions). Visitors must take natural-gas shuttle buses from the visitor center into the canyon. This means very little traffic in the canyon and no exhaust fumes in your face. Buses are not allowed to pass you. Bus drivers may not pass bicycles from behind in the canyon, so you never have to worry about a big bus scaring you (and your kids) as it flies by. Buses have to wait until you pull off the road and stop. It’s all downhill. If you follow the Fit Family Robinson itinerary below, you will do the uphill on the bus (the shuttles have bike racks) and the downhill on the bike. Totally doable for beginners and kids, and totally doable on any kind of bike (road, mountain, cruiser, bmx). It’s peaceful. Without cars, and with buses spaced out every 15 minutes, there are times when you have the entire canyon road to yourself. If you’ve ever crawled along in a long line of cars at Yellowstone, or fought for parking spaces at Yosemite, you’ll appreciate how magical it is to soak in all that scenery from an empty road. Note: while bikes are the perfect way to travel from trailhead to trailhead in the park, they are not allowed on the hiking trails (except for the Pa’rus Trail, see below). 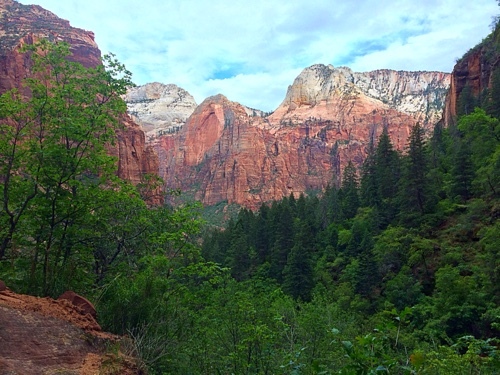 Here’s our advice and itinireary for the trip we took to Zion on May 24, 2015. 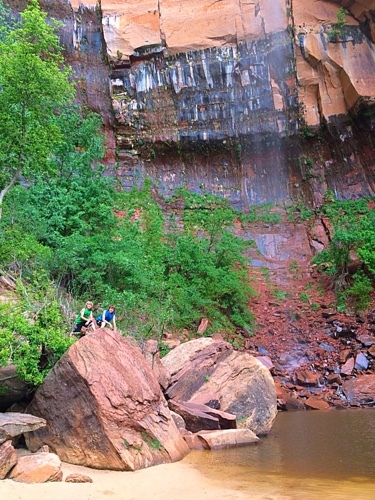 It offers kid-friendly hiking, 8 miles of easy downhill biking, and time to kick back. And if you’re not biking, you can follow the same route, just take the shuttle between trailheads. Park in Springdale. On busy weekends, particularly during holidays, the line of cars trying to get into the visitor center can be backed up all the way into town. And the visitor center lot fills up quickly. Save yourself the wait and park in Springdale. There is ample free parking. Ride your bikes to the visitor center. Although you could load your bikes onto a free shuttle in town, the shuttles have to wait with the rest of the cars to get into the visitor center. And you have to change shuttles at the visitor center anyway before continuing on in the park. Save yourself the hassle and ride roughly a mile to the visitor center. Once you enter the park, load your bikes on a shuttle and take it to the last stop, the Temple of Sinawava. It will take roughly 40 minutes. The shuttle buses are equipped with easy-to-use bike racks, but if you have any trouble, the drivers are very helpful. One drawback is that the bike racks only hold 3 bikes. We have a family of 4 so we had to split up. Minor inconvenience. Bike to Zion Lodge. On the bikes again for a 2 mile ride down to the lodge, where we stopped for lunch. Because it was Memorial Day weekend, the food line was about an hour for your typical burger/fries/rubber chicken. My advice: pack a lunch. Either way the lodge is a nice spot to relax, sit in the shade and take a nap (allegedly). Ride to visitor center. Ride about 2.5 miles to Canyon Junction, where you’ll take a right onto the Pa’rus Trail. This paved trail is the only trail that allows bikes. It will take you 1.75 miles along the river back to the visitor center. If you don’t take the trail, you’ll end up on the lower canyon road that allows vehicles driving through the park on the Zion-Mount Carmel Highway. So it’s more crowded and less safe. And not nearly as enjoyable; the Pa’rus Trail is a pleasant, serene ride. Back to Springdale. If you’re tuckered out when you hit the visitor center, jump on a shuttle into Springdale. Otherwise, keep riding another flat, easy mile into town. Lots of water – there are fountains and water bottle filling stations at some of the trailheads, but no water out on the trails. Jacket. Even on a hot day it can get cool riding down the canyon in the shade. Rainstorms can arrive quickly in Zion. In the summer they can be a welcome break from the oppressive heat. 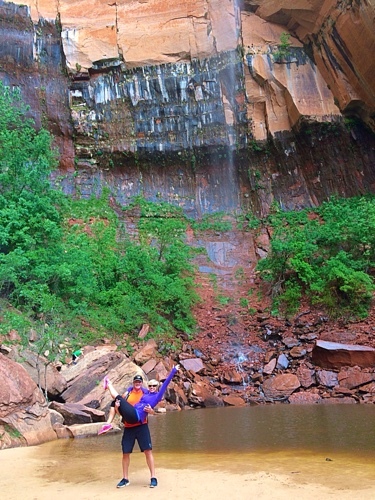 We got soaked in a brief shower on our trip but it didn’t dampen our day in the slightest. Take a jacket and a good attitude. If you’d like more information on planning your trip, including where to stay, where to eat, etc., leave us a comment and we’ll do our best to help. Have fun and stay safe! P.S. 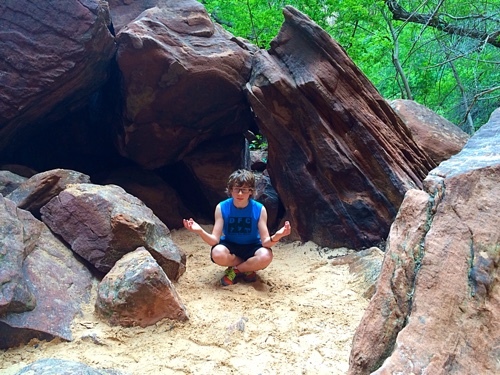 Here’s a link to the free 5-minute fitness video we shot while at Zion. 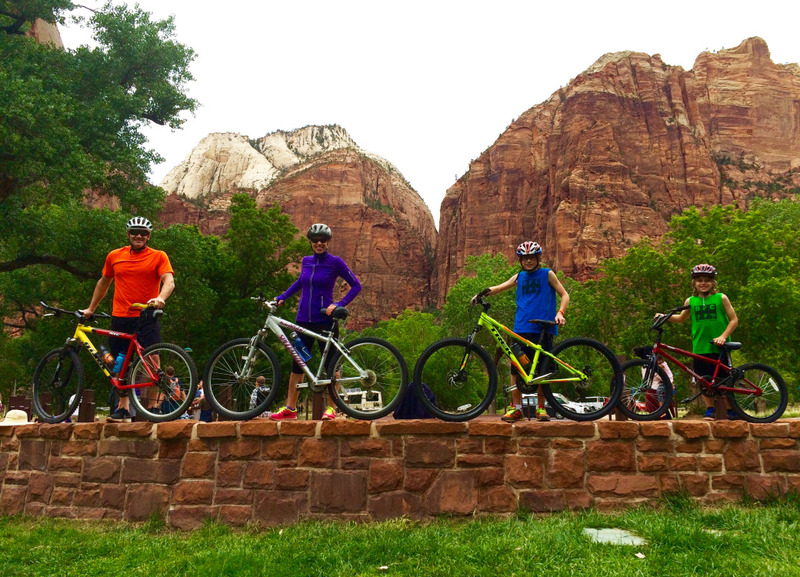 BIKE PHOTO: The photo of the four of us standing with our bikes on the red rock wall that is featured for this article was taken by a very cool family we met at Zion Lodge. Thanks to @THEEVANSFIVE family for taking this amazing photo for us. We love it! We are heading up to Zion in two weeks with our bikes. Thank you for putting this together! Thanks.. we just got home and taking the shuttle at 7:15am up to Temple of Sinawava was the bomb (freezing up there at that time)… our driver put all 4 bikes on, he was super! We pretty much followed your flow and when we rode back to the Visitors Center on the Pa’rus Trail and passed the millions of people in line for the Shuttle at 11:30am we said… bikes are the way to do Zion (and the earlier the better). 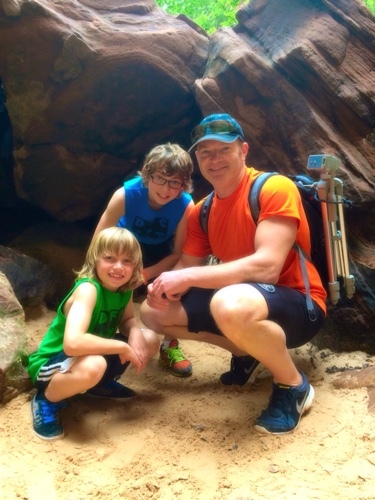 PS We went to Snow Canyon State Park in Ivins/St George before we headed to Zion… great trails for kids, scrambling up rocks and also venturing into lava tubes and you can bike a bit there too… no crowds like Zion.